If you have an area of your yard that gets partial sun and are looking for a flowering tree that will do well in that area, you have many choices. Some trees that are often recommended for full sun may do well with partial sun, depending on how much sun the area gets. As you are planning your flowering tree, consider how much space you have above your tree. If you have taller trees, consider planting a tree that is shorter to avoid interfering with taller trees. Magnolias are flowering trees that grow to between 20 and 30 feet in United States Department of Agriculture (USDA) Hardiness Zones 5 through 8. Magnolias bloom in a variety of colors, depending on the variety. Colors include white, pink and purple. Magnolias grow best in moist soil that drains well and do well in wide ranging light conditions, including partial sun. Flowering cherries can grow to nearly 40 feet tall, depending on the variety. A number of dwarf flowering cherries are much smaller, with some topping out at between 6 and 8 feet. Flowering cherries grow in USDA Hardiness Zones 4 through 8a and do best in many different soils, including clay, loam, sand, and both acidic and alkaline soils, as long as those soils drain well. Although many people think of ornamental flowering cherries as requiring full sun, most will do well in partial sun. Mimosa trees produce fuzzy pom-pom like flowers that are, in most cases, pink. Smaller mimosas grow to as tall as 5 feet with full-sized trees growing to 25 feet tall. Mimosas are tolerant of high heat and grow in many soil types that drain, but do best in alkaline soil. They are cold hardy down to USDA Hardiness Zone 7 and grow well in locations that get partial sun. Tulip trees do well in partial sun and can grow to as tall as 80 feet. This fast-growing tree grows large flowers with six yellowish green petals surrounded by green sepals. The flower resembles a tulip. 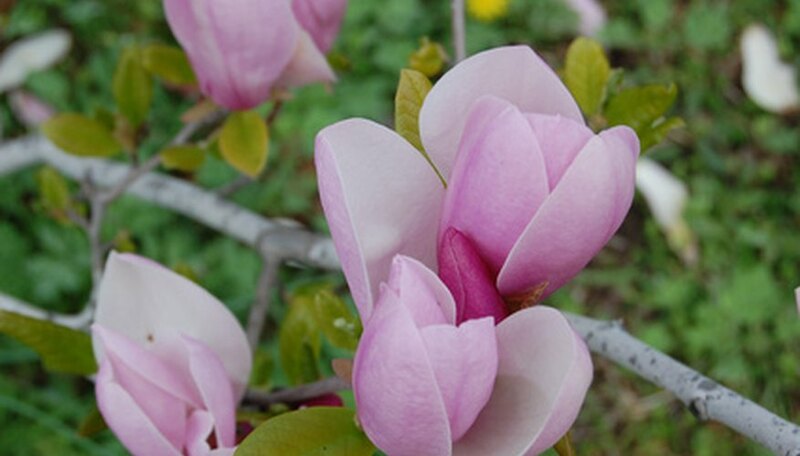 The tulip tree grows in USDA Hardiness Zones 4 through 9 and does best in a rich, moist soil. However, as the tree matures and establishes, it can tolerate periods of drought.